Gladiator Repipe in San Jose is proud to offer exceptional and competitively priced copper repipe services to the entire Bay Area community. Our team members take pride in exceeding expectations, and our repipe specialists are professionally trained and prepared to help with any job you have. Call us today at (408) 649-7290 to get your repiping job done as soon as possible. Or stop by our conveniently located shop at 541 W Capitol Expwy Ste. 10-223, San Jose, CA. We want to stand behind our results, so every job we do is done meticulously. Our team is qualified to handle both copper and PEX repipe jobs. Our repipe plumbers are equipped with the tools needed to ensure that everything is installed correctly every time. We’ll work efficiently, completing all our work promptly without compromising on the level of our results. We aim to take the stress out of any copper repipe project. We employ a highly experienced team and we are ready to handle jobs large and small, simple or complex. You can trust us to perform a thorough analysis of any situation and provide you with options for moving forward with a job. We can help with anything from galvanized pipe replacement to general repiping work. Your property will be treated with care while we’re working so that none of your belongings get damaged. We want to make sure that every job we take will go as smoothly as possible. Our repipe professionals will pay attention to all the small details of each step of the job to ensure that everything is done correctly. We’re friendly and ready to answer any questions you have about our work or the specifics of your job. Our plumbers stay current with any changes in their line of work. 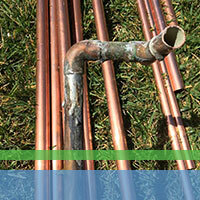 We’re proud to offer copper repipe in San Jose. Our rates are highly competitive, and we’re happy to provide our customers with an accurate estimate before we do anything. We want to take care of all your repiping needs so that you can have peace of mind about your plumbing system. Active leaks or wet spots? If the answer to any of these questions is “yes,” then repiping could be the answer. Gladiator Repipe, Inc. is proud to offer to repipe services to home and business owners alike. Whether you’re looking to replace old copper pipes or newer pipes that simply aren’t serving their purpose, we have the tools and skills to get the job done quickly and in a manner that not only meets, but surpasses your expectations. We pride ourselves on thorough, efficient repiping services coupled with affordable rates. If you hire us for your repipe, we pledge to leave your property clean and neat once the job is done.